KIEV, Ukraine -- Jim Slattery arrived at the Stalin-era presidential headquarters in Kiev, Ukraine, with an unusual gift for the nation’s strongman leader: a bust of Abraham Lincoln. Trump’s former campaign manager had receded into the background, but there’s renewed interest in the millions he made promoting Kremlin-friendly interests. It was March 2013, and the former U.S. congressman had traveled to Ukraine to persuade President Viktor Yanukovych, an ally of Russia’s Vladimir Putin, to free Yanukovych’s arch rival from prison. The statuette came with a hopeful message: You, Slattery told the president, could be the Lincoln of Ukraine—a leader who binds up the nation’s wounds. What Slattery didn’t know was that another American operative was helping the president defend the imprisonment of Yulia Tymoshenko, an act widely condemned in the Western world. His name: Paul Manafort, future presidential campaign manager for Donald Trump. What began with questions about Moscow’s meddling in the 2016 U.S. election has Democrats, and even some Republicans, now warning of Trump’s Watergate. Until recently, Manafort had receded into the background as the uproar over Trump’s firing of his national security adviser, Michael Flynn, and then the FBI director, James Comey, began to shake the White House. But the Manafort story—a tale of pro-Russia players, political tradecraft and cunning financial maneuvers—has never gone away. The reason, in a word, is money. Manafort, who less than a year ago was playing a central role in the Trump campaign, made millions of dollars over a decade promoting Kremlin-friendly interests in Ukraine and beyond. No other Trump associate has profited as handsomely from ties to Russia-linked businessmen and politicians. Manafort has long maintained that he’s done nothing wrong and had nothing to do with Russian interference in the 2016 U.S. election. Nonetheless, various U.S. authorities are once again asking questions about his financial dealings, particularly those involving Ukraine and his U.S. real estate investments. Manafort says he is cooperating. Two dozen interviews in Ukraine, Russia and the U.S., as well as a review of scores of documents from Ukrainian prosecutors, offer a detailed portrait of Manafort’s work in Kiev, which provided a template for some aspects of Trump’s populist campaign, including several key members of the team. In the decade before he worked for Trump, Manafort’s efforts did for Moscow what its finest political minds had failed to do: help get a pro-Russian candidate installed in Kiev. It culminated in Russia’s annexation of Crimea, the revival of Cold War tensions, Western sanctions on Russia’s energy and banking sectors and Russia’s campaign to get those sanctions removed. Manafort, 68, had claimed Yanukovych was the one Ukrainian who could lead his country closer to the West at a pace Putin could stand, according to Dan Fried, a former U.S. assistant secretary of state for the region which includes Ukraine. “Manafort’s guy turned out to be not the guy Manafort said he was,” Fried said. Jason Maloni, a Manafort spokesman, denied that his work helped Russia. Manafort, who denies any contact with Russian government officials, never registered as a lobbyist for a foreign government for his Ukrainian work. His spokesman said Manafort had “received formal guidance recently from the authorities” on registering under the Foreign Agents Registration Act for some of his work, none of which, he contended, was for the Russian government. Manafort declined to be interviewed for this story. Ukrainian prosecutors are investigating what they call a “criminal organization” set up by Yanukovych via bribes and theft of state assets before he fled to Moscow after the killing of more than 100 protesters in 2014, and they are looking at what role Manafort may have played in the suspected scheme. They’ve repeatedly asked the FBI for help to question Manafort as part of their inquiry into a New York law firm in connection to a report that largely defended the Tymoshenko prosecution. “We’re waiting for a response,” says Serhiy Horbatyuk, Ukraine’s head of special prosecutions, his desk piled high with papers. For Manafort—who resigned from the Trump campaign after six months amid reports of his work in Ukraine—ties to pro-Russian politicians go back to 2005. He played a key role in transforming Yanukovych, who was convicted in his youth of robbery and assault, into a popular candidate who clinched the presidency in 2010. “Manafort raised very sensitive issues to spin Yanukovych more effectively,” says Serhiy Leshchenko, a member of the Ukrainian parliament. Manafort, who speaks neither Russian nor Ukrainian, developed a close working relationship with Yanukovych, discussing—through an interpreter—politics and strategy during sauna sessions and tennis matches at the opulent Mezhyhirya palace, according to a person who worked on Yanukovych’s election campaigns. As the son of a Republican mayor from New Britain, Connecticut, Manafort was at the vanguard of U.S. political consultants working globally. After attending Georgetown Law School, where he led a group of young Republican activists, he went on to oversee the contested Republican conventions for Presidents Gerald Ford and Ronald Reagan before he branched out into international consulting, working for Jonas Savimbi in Angola in the mid-1980s. Manafort taught Yanukovych to look and speak like an American politician. Many thought Yanukovych, who ran the Party of Regions, started to resemble Manafort in his Italian suits and carefully coiffed dark hair parted on the side. In the five-year period from 2007 to 2012, Manafort was paid at least $12.7 million, according to a handwritten Party of Regions ledger found later in its head office. Ukraine’s anti-corruption bureau and the FBI are investigating whether the ledger reflected any illegal payments to Manafort and to others. Manafort’s spokesman says that after being paid he had many expenses and so the payment figure does not represent profit. One payment to Manafort on the ledger matches an invoice he signed in 2009 to sell $750,000 of computers to a Belize-registered company called Neocom Systems Ltd., according to documents obtained by Leshchenko from Manafort’s Kiev office. Doug Singh, who runs International Corporate Services (ICS), which registered Neocom in 2007, says he’s received multiple requests for records from Belize’s Financial Intelligence Unit, which investigates money laundering. Belize authorities declined further comment. Evgeniy Kaseev, listed as a director of Neocom, couldn’t be reached for comment. Manafort’s spokesman disputed the authenticity of the invoice and said Manafort is unfamiliar with it. Manafort’s contacts with pro-Russian politicians go beyond Yanukovych and the Party of Regions. Viktor Medvedchuk said he met Manafort in 2014. Medvedchuk is so close to the Kremlin that Putin is godfather to his daughter and he is under U.S. sanctions because of his role in the conflict in eastern Ukraine. He said he had not had contact with Manafort since then. Manafort’s spokesman confirmed the 2014 meeting but said he didn’t recall interacting with Medvedchuk directly. Even after Russia annexed Crimea in 2014 and Yanukovych fled to Russia, Manafort returned to Ukraine 17 times, earning at least $1 million to help reelect pro-Russia politicians, according to a party official who worked with him. Manafort’s spokesman declined to comment on that payment. The idea of working in Ukraine first came to Manafort in 2004 from Oleg Deripaska, a Russian billionaire who controls aluminum producer Rusal, according to a person familiar with the situation. Ukraine was in the throes of the Orange Revolution—protests over allegations of electoral fraud in Yanukovych’s November 2004 victory. The Supreme Court ordered a new election. Manafort’s then-partner, Rick Davis, went to Kiev and concluded it was too late to help. Yanukovych’s pro-Western rival Viktor Yushchenko won. Manafort arrived in 2005 to advise Ukraine’s richest man, billionaire Rinat Akhmetov, who was worried his business interests might be seized by President Yushchenko. That same year, Davis Manafort Partners Inc. registered a company in Moscow at an address used by more than 80 other firms. It’s unclear whether the company actually functioned, and Manafort’s spokesman said no such office was opened. While working in Ukraine, Manafort earned millions from a side private equity fund with Deripaska, according to a lawsuit by Deripaska, who is suing Manafort in the Cayman Islands over the soured business partnership. Akhmetov, then a major financial backer of the Party of Regions, asked Manafort to help Yanukovych’s 2006 parliamentary election campaign. Manafort hired as many as 40 top-flight U.S. campaign workers, some of whom later worked on the Trump campaign, including Tim Unes, who organized Trump’s rallies, and Rick Gates. A workaholic who answers emails at 3 a.m., Manafort and his team set about portraying Yanukovych as a strong leader, picturing him beside Putin and German Chancellor Angela Merkel. Crucial to the strategy—and new to Ukraine—was research from focus groups and better polling to drive messaging. Among the issues: the rights of Russian-speakers and opposition to Ukraine’s joining NATO. “He was going for visceral issues and an emotional reaction,” says Kateryna Yushchenko, the American-born wife of former President Viktor Yushchenko and a onetime State Department and White House official. Even though he hired Manafort, Yanukovych retained Russian advisers from Moscow, including Vyacheslav Nikonov, a member of Putin’s United Russia faction, and Sergei Glazyev, Putin’s current adviser on Ukraine, according to Taras Chornovil, a top Party of Regions official until 2008. A spokesman for Glazyev confirmed he advised Yanukovych from 2004 to 2009 but didn’t consult with Manafort. Nikonov didn’t respond to requests for comment. Manafort’s spokesman said he doesn’t recall interacting with either one. The Party of Regions emerged from the 2006 election with the largest number of seats in parliament; Yanukovych became prime minister. His victory was short-lived, however. His political struggle with President Yushchenko resulted in elections a year later. This time Manafort ran a cookie-cutter campaign. In reality, Manafort’s advisers had plucked a stock photograph of an American girl. His party did well but Yanukovych was pushed into opposition after Tymoshenko cobbled together a ruling coalition. In 2008, then-President Yushchenko announced a campaign for eventual Ukrainian membership in NATO. To exploit widespread opposition to NATO, Manafort’s team brought a truck to the parliament filled with anti-NATO balloons and instructed parliamentarians to each take one into the chamber. Ukraine’s hope of joining NATO ended with its 2010 presidential election. With Manafort guiding him, Yanukovych won narrowly. Manafort prepared Yanukovych’s first visit as head of state to Washington that April. He advised Yanukovych to give up Ukraine’s remaining stock of highly enriched uranium, according to a person close to the situation. Ukraine had given up its nuclear weapons in 1994 and there was little sacrifice involved in yielding the uranium. But it helped Yanukovych clinch a major prize: a photo of him beaming alongside President Barack Obama. Within months of his victory, Yanukovych ordered criminal investigations into Tymoshenko, culminating in a sentence of seven years in jail. Condemned around the world, her prosecution would become a flashpoint in negotiations between Ukraine and the European Union on an association agreement. Manafort was closely involved in recruiting the firm of Skadden Arps Slate Meagher & Flom LLC on behalf of the Ukrainian Justice Ministry to write a lengthy report on Tymoshenko’s prosecution. He met with Justice Minister Oleksandr Lavrynovych to go over the contract with Skadden and emailed with Skadden partner Greg Craig, according to documents uncovered by Ukrainian prosecutors. The ministry agreed to pay Skadden a mere $12,000, just below the threshold requiring it to go to a public tender. But much more money was to come to Skadden. Prosecutors believe Manafort drew up a six-page media strategy plan with FTI Consulting on how to use the Skadden report, based on documents they have examined. The report, released at the end of 2012, criticized some aspects of the case but concluded that the evidence supported her conviction and that her due process rights hadn’t been violated. After the document’s release, Skadden signed a new contract with the ministry in 2013 that envisaged “additional work” and paid the firm $1 million, the prosecutors say, noting that no additional work was done. Craig didn’t respond to requests for comment. Manafort’s spokesman said, “Mr. Manafort has no reason to think there was anything untoward” about the Skadden report. 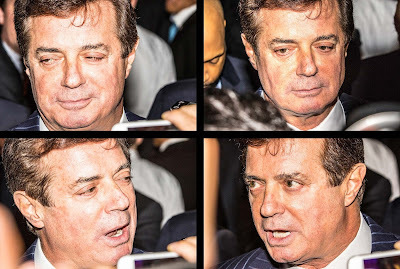 After Skadden prepared its report, Manafort was prepping the Party of Regions for another parliamentary election in October 2012, bringing in Tony Fabrizio, who would later become the Trump campaign’s chief pollster. International monitors said the elections were marked by the abuse of state resources and lack of transparency in party financing. Manafort advised Yanukovych to push ahead with an association agreement with the EU. But the EU insisted he release Tymoshenko, while Putin pressured him to abandon the deal. In November 2013, Yanukovych terminated negotiations with the EU. The move triggered widespread protests. Thousands camped out on Kiev’s Independence Square. More than 100 were killed in 2014 right before Yanukovych fled to Moscow. Ukrainian prosecutors are investigating who’s responsible and have combed through hacked text messages from Manafort’s daughter, Andrea, about her father’s role in cracking down on the uprising. Andrea Manafort didn’t respond to requests for comment. Months after Russia annexed Crimea, Manafort returned to Ukraine to advise the pro-Russian party, now known as the Opposition Bloc, for the 2014 parliamentary elections, again bringing Fabrizio on board. Nestor Shufrych, one of the party leaders, says Manafort pushed for them to be both anti-NATO and the voice of Russians in the east. Shufrych thought they had no chance but they got nearly 10 percent, with 29 seats. Manafort personally approved the list of candidates, according to another party official. Shufrych says the party paid Manafort roughly $1 million. The two celebrated over a bottle of cognac at Manafort’s Kiev office. “The investment in Manafort paid off,” he said.